Preheat oven to 350°F. Spray both halves of a sports ball baking pan with baking spray. 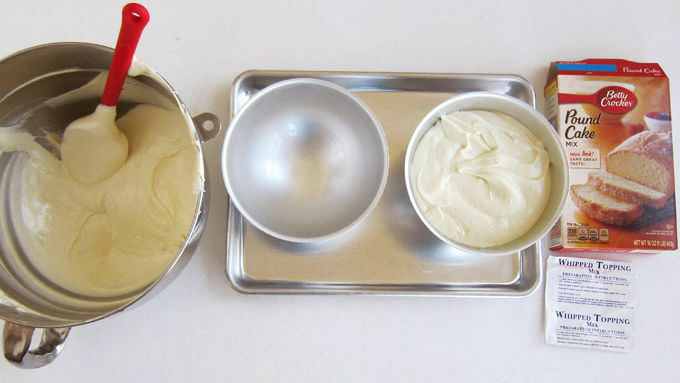 Combine pound cake mix, powdered whipped topping mix, butter, eggs, egg white and water in the bowl of a stand mixer. Beat on low for 30 seconds, then beat on medium for 2 minutes. Divide batter equally between both pans. Bake for 45-55 minutes until golden brown and a toothpick inserted in the center of the cakes comes out clean. Allow cakes to cool for 10 minutes, then remove them from the pans. Allow them to cool completely. While cakes are cooling, roll out pink modeling chocolate to 1/8-inch thickness. Cut a large heart, about 7 inches wide, to place under the cake to form the warm fuzzy's feet. 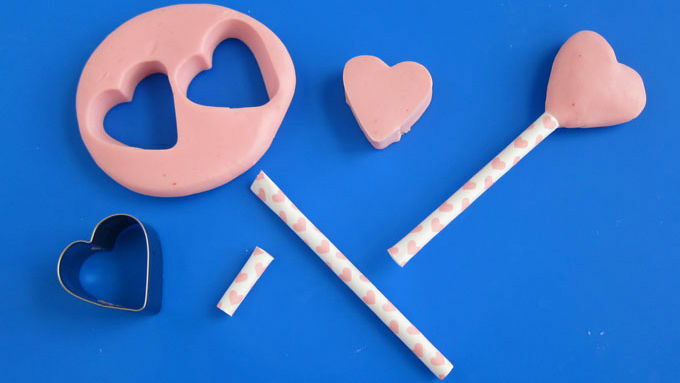 Cut a cake board into a heart shape that is just a bit smaller to set under the pink heart. Re-roll the modeling chocolate to 1/2 inch thick, and cut two 1-inch hearts to use as the top of the warm fuzzy's antennae. Cut a paper straw into two 3 1/2 inch long pieces. Flatten one end of each and insert into the small hearts. Reshape hearts as needed, so they stick to the straw. Roll out the white and black modeling chocolate to about 1/16-inch thickness. Cut two 2-inch white circles and two 1 1/2-inch black circles. 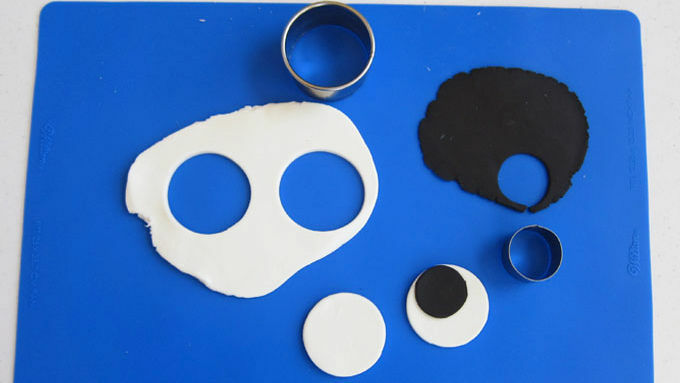 Attach one black circle to each white circle using a small dab of water. Set modeling chocolate pieces aside to dry. Once cakes are cool, place them back in the pans and trim any cake that sticks out above the top edge. 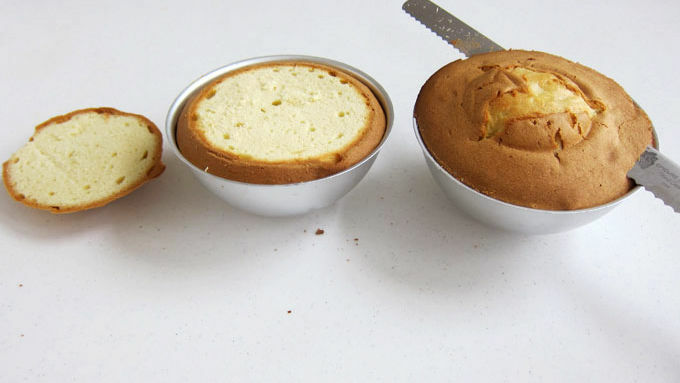 Remove cakes from pans and cut a tiny bit off the bottom of one cake, so it sits flat. 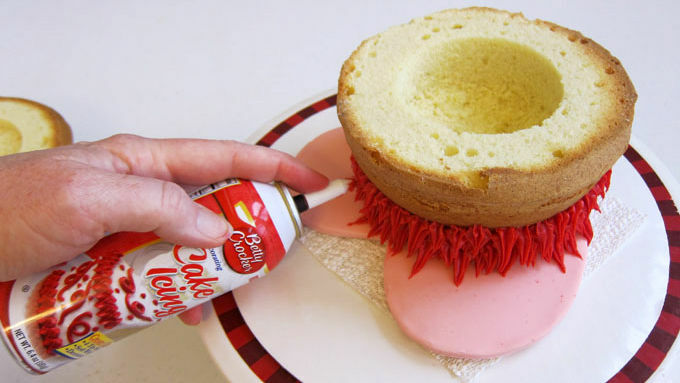 Cut a 2 1/2-inch round by 2 1/2-inch deep well in the center of the bottom cake. 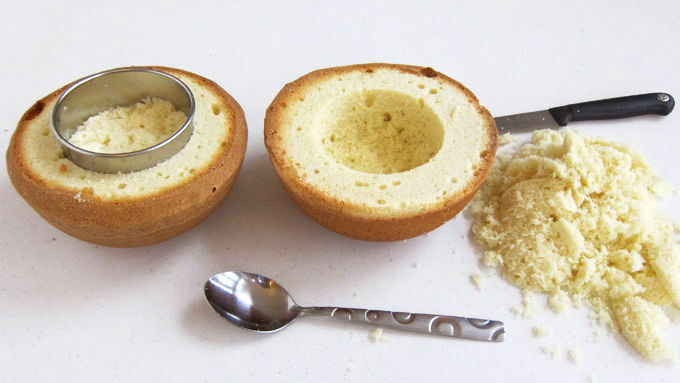 Cut a 2 1/2-inch round by 1-inch deep well in the top cake. Turn the bottom cake over. Begin piping red icing fur in a circular pattern about 2 inches from the center. 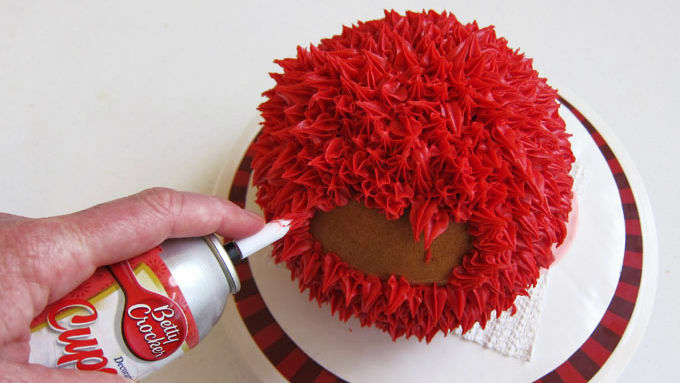 To make the fur, attach the star tip to a can of red cupcake icing, hold the can just above the cake, and press down on the dispenser, allowing a small amount of frosting to come out, then quit pressing and pull up and away, creating a spike of frosting. Create 5 rows of spikes then turn the cake right side up and set it towards the back of the large pink modeling chocolate heart. 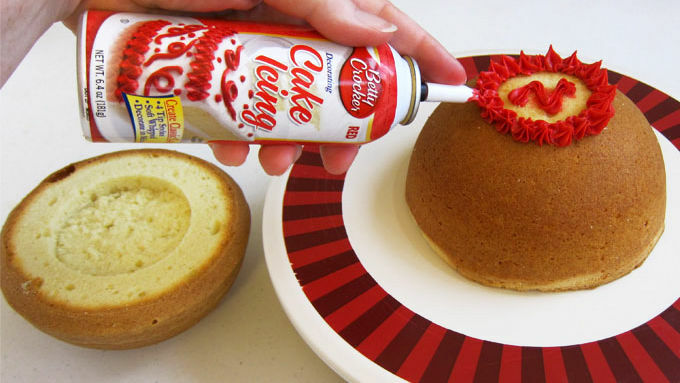 Continue piping on spikes of red frosting until you cover the entire bottom of the cake. Fill the well in the bottom cake with candy hearts. Pipe a 1-inch border of red frosting around the top edge of the bottom cake, then set the other cake half on top. Continue piping on spikes of red frosting until you cover the entire top half of the cake. Insert the two antennae into the cake and add the eyes. This piñata style cake will make your loved ones feel all warm and fuzzy inside. When a friend or family member says or does something that warms your heart, you've been given a warm fuzzy. Most often, you simply feel good inside, but sometimes the warm fuzzy will actually be real – in the form of a pom pom of yarn with big feet, googly eyes, and antennae. These kind of warm fuzzies are sometimes given to loved ones to show how much you care – plus, they're darn cute! 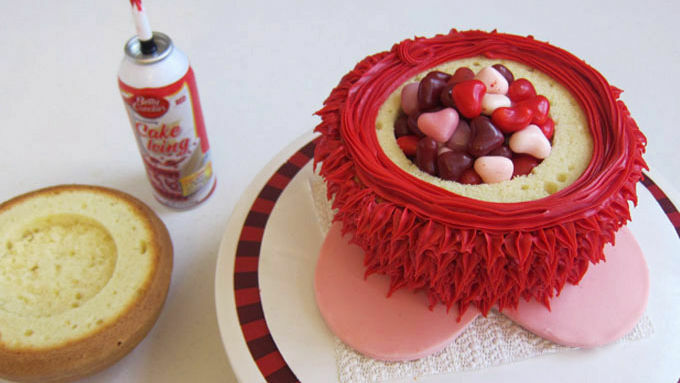 For Valentine's Day, instead of giving away balls of yarn, why not share a sweet candy-filled cake with your loved ones? 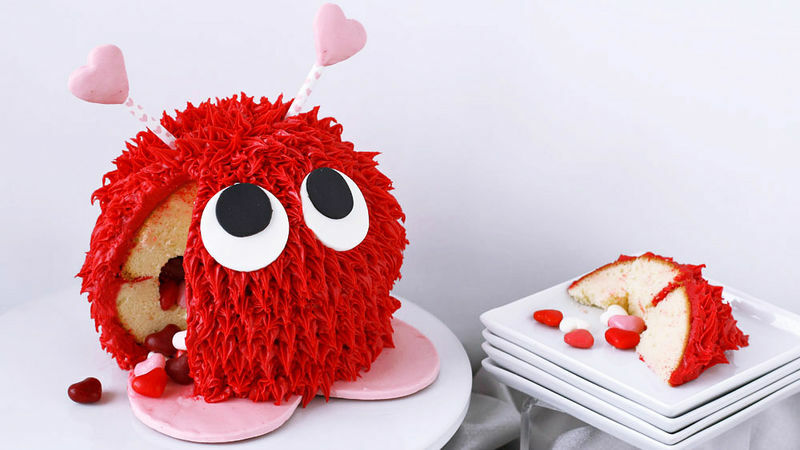 I bet anyone that receives this adorable cake will feel warm and fuzzy inside!